As with his previous film ANTICHRIST, Lars von Trier opens MELANCHOLIA with a sequence of both great beauty and great horror. The horror that set the events of ANTICHRIST in motion was small in scale and very much personal – the loss of a child. 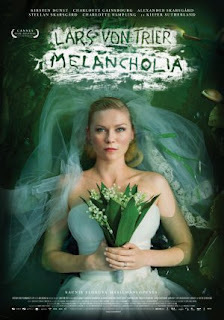 In MELANCHOLIA, the horror is apocalyptic in the truest and widest sense sense, literally the end of the world. But seen from a distance, it's quite a captivating show as the rogue planet that gives the film its title crashes into and annihilates the Earth. After opening his film with such utter destruction, von Trier then pulls back in time and scale to focus on newlyweds Justine (Kirsten Dunst) and Michael (Alexander Skarsgård). The couple seem happy, even as they find the stretch limo they've hired is unable to navigate the roads to their reception. The couple wind up having to walk, and although they are late, at first things seem to go relatively well. By the time the reception is over, however, both Justine and her marriage to Michael have completely fallen apart. Much of the blame can be placed on the severe, soul-crushing depression Justine lives with on a regular basis, but the behavior of her family and others at the reception certainly doesn't help. For its second half the film switches focus to Justine's sister Claire (Charlotte Gainsbourg). Justine, still an emotional wreck, is staying with Claire somewhat to the chagrin of her scientist husband John (Keifer Sutherland). He doesn't have much time to spend disapproving, though, as he is absorbed in research and observation of the rogue planet we saw in the film's prologue. John and his fellow scientists are certain it will merely fly by the earth harmlessly, but Claire isn't so sure. Having seen the opening of the film, we in the audience share Claire's concern, but this being a movie we also are used to holding out hope for some last minute rescue that will make everything okay. Then again, this is a Lars von Trier film, so all bets are off. This is undoubtedly the biggest, most unrealistic and affected film that Von Trier has made in quite some time, perhaps ever. Even his supernatural horror miniseries The Kingdom feels more grounded in reality. That's not a criticism of either approach, merely an observation. Realism as a technique has its merits, but fantasy has a way of effectively conveying themes and ideas that may be too dry or unpalatable when presented in a more straightforward manner. Here, it's an examination of depression, and the notion that those who suffer from it may better deal with extreme situations than those who are more traditionally well adjusted, with Dunst's Justine ultimately proving more effective than her sister at pulling the family together in a time of crisis. Dunst excels in her role, making us feel compassion for a character who does a lot of unlikeable things (and who is apparently based somewhat on von Trier himself), a performance that won her the acting prize at Cannes. It may well go on to win her other awards, or at the very least nominations. Gainsbourg is just just as good, but in a smaller, less showy role. Aside from the earlier mentioned Keifer Sutherland and Alexander Skarsgård, the supporting cast also includes Alexander's father Stellan, Udo Kier, Charlotte Rampling, and John Hurt, making for a rock solid ensemble. As is typical of the director, von Trier managed to stir up some controversy around his film at the Cannes film festival by making some stupid remarks about being a Nazi. No real point in being offended, since this is just the latest in a long line of such sad cries for attention by the auteur. Many of von Trier's past films have seemed equally starved for attention, including elements that some might feel are there solely for shock value. I wouldn't say “solely”, but to believe von Trier doesn't take joy in getting a rise out of people is to ignore all the evidence to the contrary. This time around there's none of that, and despite its downbeat subject matter MELANCHOLIA is arguably von Trier's most accessible film. Of course “accessible” is a relative term, and while the lack of graphic genital mutilations and the presence of a few bankable stars give this film a shot at reaching a wider audience in America than von Trier has had since 2000's DANCER IN THE DARK, we're still a long way from mainstream entertainment. But if you're the sort who is always complaining nobody makes serious English language movies for adults anymore, quit your whining and catch this on the big screen while you have the chance. 3 1/2 out of 4 stars.